Fed up of those running board creaking? "Place this thin 1/16"" anti-squeak material on top of each brace before setting on the running boards. 4' Long x 1/16"" x 3/4"" woven treated fabric." Set of two running board polished aluminium step plates for the model A with an oval Ford script design 7-3/4 x 8-1/4. Running board Step Plate Screws 1928-31. Screws and nuts to mount the above step plates to the running boards. One kit is enough to mount both step plates. These are for the early cast running board braces. The special bolts with the high crown as original. The later style for the steel running board braces. Fender & Running Board Mount Kit for 1928-29 Model A Ford with cast iron running board brackets. Includes headlight bar mounting, fender to running board splash apron, splash apron to frame, running board to running board brackets, rear fender to body, and fender edge to fender brace. Fender & Running Board Mount Kit for 1928-29 Model A Ford with pressed steel running board brackets. Complete fender & running Board Mount Kit for 1930-31 Model A Ford. The running boards for the 1928-29 passenger cars. Come with zinc trim, and the rubber matting. All you need to do is paint the back side, and bolt'em on. The 1928-29 running board has ribbed design rubber, with a metal trim around all four edges. The 1930 running board has pyramid design rubber, with a metal trim around all four edges. The 1931 board has pyramid design rubber, but only a metal trim on the outside edge. The other three edges have a moulding pressed into the rubber. The running boards for the 1930 passenger cars. The running boards for the 1931 passenger cars. A well made set of boards & shields for the 1930 passenger cars. The shield is spot welded to the board and comes with the matting and zinc trim installed. Sold in pairs only. Made in USA. These are the all steel running boards for the 1928-29 pick-up trucks. These are the all steel running boards for the 1930-31 pick-up trucks. Running Board set for the 1928-29 AA truck. 69-3/4" long. Made in USA. Running Board set for the 1930-31 AA truck. 29-1/2" long. Made in USA. The rib design matting for the 1928-29 running boards. Each piece measures 46" x 9-1/4". Adhesive backed, just peel and stick'em on. Made in USA. The pyramid design running board matting for the 1930 Model A Ford. This has an adhesive backing so all you need to do is pull the backing off, and stick them on the running board. Size 39 1/4" long. Tapers from 9" to 11 3/8"
The pyramid design runng board matting with the half round trim moulded into the rubber. Size 39 1/4" long. Tapers from 9" to 11"
Replacement Zinc trim for the 1928-29 running boards. (Zinc was used originally). Set does both boards. Replacement stainless trim for the 1928-29 running boards. 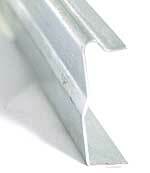 Zinc was used originally, but we also offer these stainless trims which are polished. Set does both boards. Made in USA. Replacement Zinc trim for the 1930 running boards. Replacement stainless trim for the 1930 running boards. Replacement Zinc trim for the 1931 running boards. Replacement trim for the running boards. 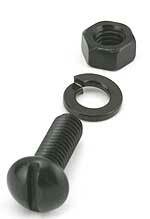 Set of round headed bolts with lock washers and nuts. Mounts the running board brackets to the frame. One set does all 4 brackets. 1928-31 Running Board Bracket Rivet Set includes ten 5/16 D. X 1" Large Round Head Rivets and two 5/16 D. X 1-1/2" Large Round Head rivets. Front Running Board Bracket for the 1928-31 in pressed steel. They were originally riveted to the frame. We sell rivets or bolts to mount them. Made in USA. Left Rear Running Board Bracket for the 1928-31 in pressed steel. They were originally riveted to the frame. We sell rivets or bolts to mount them. Made in USA. 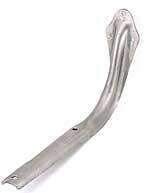 Right Rear Running Board Bracket for the 1928-31 in pressed steel. They were originally riveted to the frame. 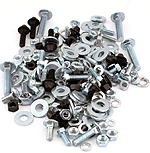 We sell rivets or bolts to mount them. Made in USA.